Topics as diverse as jellybean working and buildings that listen in to conversation were canvassed at the Mirvac Future of Workplace Symposium yesterday. Speaking at the Museum of Contemporary Art, futurist, author and commentator Philip Ross outlined a wireless future with workers finally liberated from their desks. Sharing the stage with Mr Ross was one of Australia’s most respected architects, Richard Francis-Jones of design firm FJMT, who described a richer more interesting city that defied predictions of obsolescence. Mirvac Group Executive Commercial Development, David Rolls, said technology and the advent of cloud-based computing had changed the nature of work and the workplace forever. “We are at a critical point where we can choose to embrace the future or run the risk of becoming irrelevant. As a landlord, developer and manager of significant commercial assets, Mirvac has a leading role to play in making sure our clients, and by extension, our cities, are equipped to deal with the future. 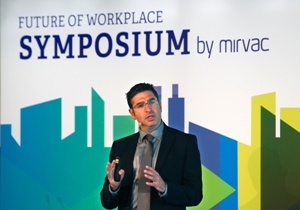 “It is for this reason that we invited some of the foremost thinkers in this arena to speak at the Mirvac Future of Workplace Symposium." Mr Ross, the London-based founder and CEO of UnGroup and UnWork, described a “perfect storm” in which portable technology, cloud computing and sustainability issues had converged to force the most radical change on work and cities in centuries. “We are undergoing the biggest workplace change since the industrial revolution,” said Mr Ross. “It is going to impact how we work and the cities we create. Yet most of the buildings we currently occupy are unfit for purpose and cannot respond to the shift from process-driven work to results-oriented agile work in a high tech environment." Mr Ross predicted a future in which intelligence is embedded into office buildings and individual privacy is forsaken for the greater benefit of being able to work flexibly and creatively in activity based clusters. “Jellybean working is the next big thing in the workplace,” said Mr Ross. “It is a brand new concept that arises from the problems that people have found with activity based work and agile work – being unable to find people and to know that they are working." The arrival of new technologies also provides an opportunity to re-examine the physical design of offices that have not fundamentally changed in more than a century. Richard Francis-Jones, who designed Mirvac’s ground-breaking 200 George Street asset currently under construction in Sydney’s CBD, said that buildings of the future would be very different from those that were designed over the past century. “Technology has liberated us so we can approach design with more humanity, creating workspaces for us and not for our equipment,” said Mr Francis-Jones. “Our cities are going to grow; they are not going to diminish. They represent the concentration of our creative energy and we will need that. But we also need environments that support flexible work spaces and that are healthy to be in. “One of the key things that people are seeking from the city and their workplace is a sense of community, camaraderie and connectedness. The more that people work in a virtual domain the greater the need to experience the authentic." A panel discussion following the keynote speeches included behavioural change expert Dr Megan Divett of Puzzle Partners; Peter Calov, Partner and Head of Premises Committee at law firm Corrs Chambers Westgarth, anchor tenants at Mirvac’s 8 Chifley building in Sydney; and Max Wilson, Mirvac’s General Manager Corporate Solutions.